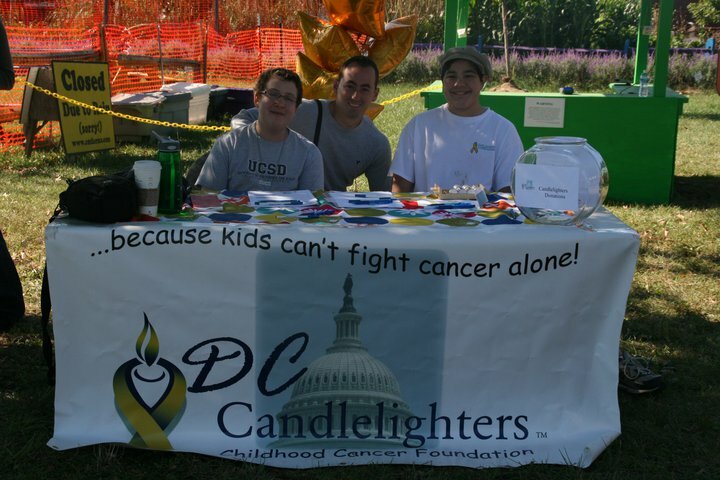 DC Candlelighters is an all-volunteer organization providing emotional, educational, practical and financial support to families of children fighting cancer. The name Candlelighters comes from the ancient proverb: “it is better to light a single candle than to curse the darkness.” DC Candlelighters strives to provide a light in the darkness because we believe no family should face the uncertain world of childhood cancer alone. DC Candlelighters serves all children with cancer and their families, long-term survivors of childhood cancer and their families, and bereaved families who live or receive treatment within 50 miles of the Washington, DC, metropolitan area. Contact us to see if we serve your area. DC Candlelighters services and programs are provided at no cost to families. DC Candlelighters is supported by the private donations of foundations, corporations, small businesses and individuals. DC Candlelighters is a local affiliate of the American Childhood Cancer Organization (formerly Candlelighters Childhood Cancer Foundation). Candlelighters, begun in 1970 by 25 parents who met in the halls of Children’s National Medical Center to offer each other support during their child’s cancer treatment, now has more than 50,000 members and 40 affiliate groups across the country. DC Candlelighters was founded by a group of mothers whose own children fought cancer, to give families facing the devastating discovery of a child’s cancer something they had wished for themselves – someone who has “been there” and understands the fear, helplessness, and financial and family pressures that grow out of a childhood cancer diagnosis. Our Board of Directors consists of parents who have had a child with cancer and professionals who have worked with families who experience childhood cancer. Our family sends our sincere appreciation for your financial assistance. My husband and I both lost a month of work when our son was diagnosed. I can’t imagine getting through this year without your help and support! When we received the news of our 3 year old daughter Madison’s diagnosis with stage 4 cancer it felt like we’d been hit by a ton of bricks. We are still trying to climb up from under. But your monetary support and wonderful events like the Mother-Daughter Spa Night offer much-needed relief in our time of despair!